The shortest player in baseball history was Edward Carl Gaedel, an American man with dwarfism who stood 3 feet 7 inches tall and weighed a mere 65 pounds (which, incidentally, also makes him the lightest player in history). 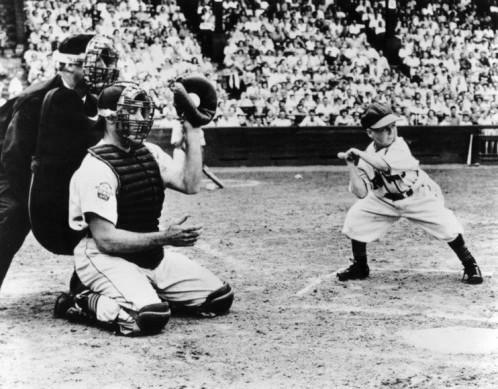 On Sunday 19 August 1951, Eddie Gaedel made his only Major League appearance in the second game of a double header for the St. Louis Browns against the Detroit Tigers. Wearing the number 1/8″ on his jersey, which actually belonged to one of the batboys, Gaedel stepped up to the plate against pitcher Bob Crain at Sportsman’s Park in St. Louis. To ensure that he drew a walk, Gaedel was instructed not to lift the bat off his shoulders, which left a strike zone of only 1.5″. Sure enough, Gaedel walked on four pitches. Later that week, American League President Will Harridge declared that Bill Veeck, owner of the Browns, was making a mockery of the game, and Major League Baseball took Gaedel out of the record books. This decision was overturned a year later, and Gaedel was returned to the books.